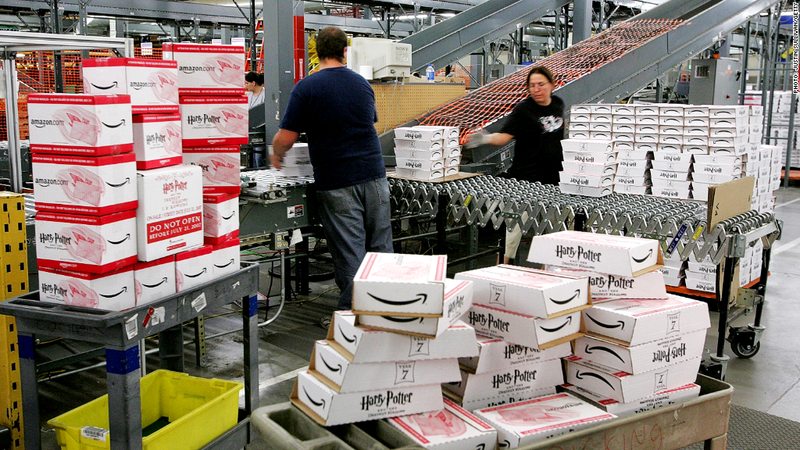 Amazon is adding 5,000 warehouse jobs. Amazon has been touting its plan to hire 7,000 new workers, and even President Obama is speaking at a company distribution center Tuesday on his jobs tour. So how do Amazon's new jobs really stack up? The online retail giant announced Monday that 5,000 of those new jobs will be warehouse positions that pay 30% more than traditional retail store jobs. On the face of it, the comparison is accurate. Dig a little deeper and there's nothing special about Amazon's (AMZN) claim. Elizabeth Brennan, a spokeswoman for Warehouse Workers United, a workers advocacy group, said pitting warehouse worker salaries against regular retail jobs is comparing apples against oranges. The average U.S. warehouse worker, at Amazon or anywhere else, earns a third more than a retail worker. The median hourly wage of a warehouse worker is $13.50, or about 30% more than the average U.S. retail worker's pay of $10.09, according to the Department of Labor. Amazon wouldn't say how much it pays its workers. 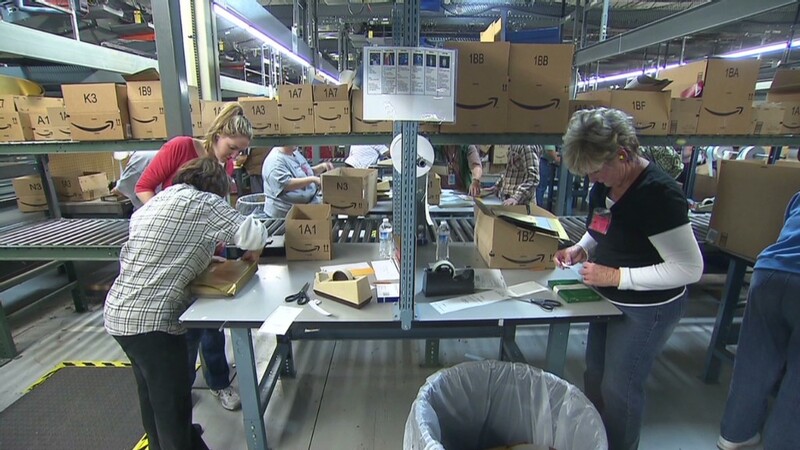 But according to data gathered by career website Glassdoor.com, Amazon pays its 20,000 warehouse workers an average hourly wage of about $12, which is below the national average. Spokeswoman Mary Osako said Glassdoor's numbers are closer to wages for entry-level workers. She added that the figure also doesn't represent the Amazon worker's entire compensation. Its employees get full benefits and stock awards on top of their salaries. In the past five years, this has added an average of 9% to workers' base pay annually, Osako said. Amazon also offers to pre-pay up to 95% of tuition for courses for its workers, regardless of whether the skills are relevant to a career at Amazon. Amazon's fiercest competitor, Wal-Mart (WMT), said it pays its warehouse workers an average of $19 per hour, with benefits. This average includes entry level workers to managers. The average warehouse worker at Wal-Mart makes just under $40,000 annually, while at Amazon would take home about $24,300 a year. That's less than $1,000 above the official federal poverty line for a family of four. Using this data as a guide, both Amazon and Wal-Mart pay their warehouse workers more than smaller, independent distribution centers. According to a study conducted by University of Southern California professor Juan D. De Lara, the average warehouse worker in the region made $16,000 per year. De Lara said many warehouse workers don't work full-time, which is why he found their average annual income to be less than half of the $30,000 figure quoted by the Labor department. -- If you're a warehouse worker and would like to be featured on CNNMoney, please share your story here.